We celebrated one of our newest family traditions yesterday. It all started a few years ago when we decided that both of our boys were old enough to watch the Mummy movie series. We decided to go all out and have a little family Halloween party with all those silly, scary food dishes you see shared all over social media sites. The mummy version of “pigs in blankets” was a given. So easy and fun with those refrigerator crescent rolls everyone eats, that I would never before bring into my house. 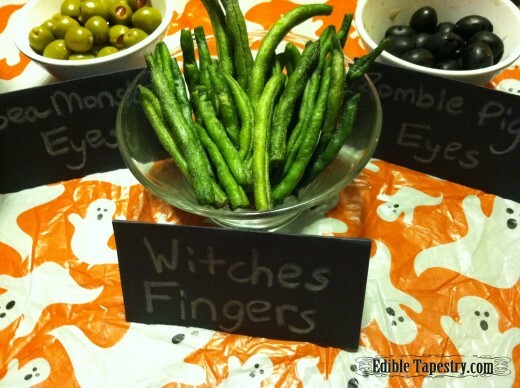 We also tried deviled egg eyeballs that year. They looked so nasty with their green yolks and olive pupils that we all tried one and just couldn’t eat the rest. I think we fed them to the chickens. We used something red to make them look bloodshot. That was just too much. I don’t recommend it. When I was making my Creepfest grocery list, I went to Pinterest (of course) to see if I could find new ideas to quickly throw together. I found casket sandwiches and black cat Oreos. Those were easy and cute, so we ended up buying the ingredients to throw them together. Zombie Vomit (I know. Horrible.) was easy to do. Salsa. I decide that guacamole would be appropriate to add to that category so put an avocado on my list, as well. At the store, after we gathered all of our ingredients, we decided to look around to see what else we could find that fit with our theme. 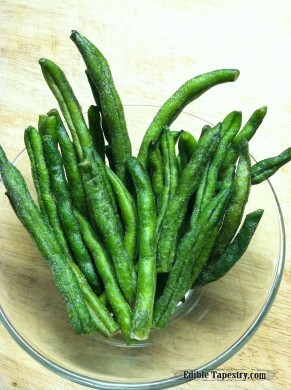 When we saw the dried green beans we thought they looked an awful lot like witch fingers. In the basket they went. Later, I set them out with sea monster eyes and zombie pig eyes. Anyone who saw The Walking Dead a couple of weeks ago or has played the new Angry Birds Halloween version will know what those were referencing. Close to the “witch finger” aisle is the imported meat and cheese case in our supermarket, so I went around the corner and grabbed a package of people fingers, too. 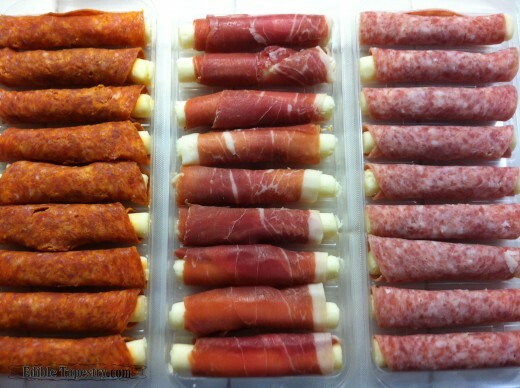 Pepperoni, proscuitto, and salami wrapped mozzarella. Sea serpent scales, or round tortilla chips, were for dipping in our zombie vomit. 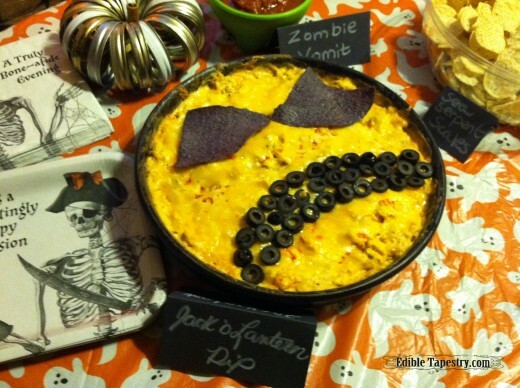 The Jack o’ Lantern dish of dip was our main course, based on a recipe I tried a couple of years ago from a fellow blogger, whose site is no longer up. It was a jazzed up version of her buffalo chicken dip. A recipe that’s pretty common. Shredded chicken, hot sauce (lots of Texas Pete in my case), a couple of packages of cream cheese, sour cream, blue cheese crumbles, and colby/jack melted over the top. I put mine in the oven at 350 and it was heated through and bubbling just as it should after 30 minutes. The blue corn chips were really good dipped in it. I make my own salsa and love it fresh. I wasn’t “making” anything last night, just throwing ingredients together so we could slap them on the table and get down to scary movie watching. 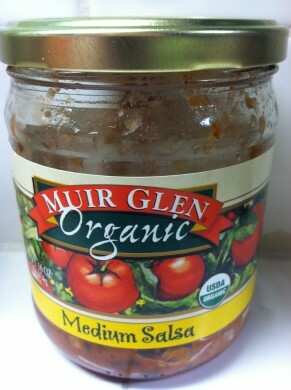 We grabbed the most delicious looking jar of prepared salsa we could find. This stuff was GOOD. Almost as fresh tasting as home made, but a little too mild for our tastes. When funky colored soda ended up going into our grocery basket, my husband and I looked at each other and talked about how awesome it would be if we had lab beakers or test tubes to drink it from. I told him I’d see what I could find in the glassware section. Bingo! 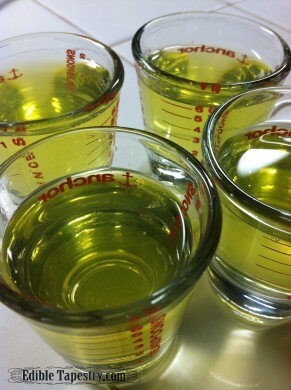 I found little shot glass measuring cups. At home I called the beverage formula, but my Portal playing teen boys said it was “Experiment 115”. Now I have to start playing Portal so I can see what this experiment is all about. 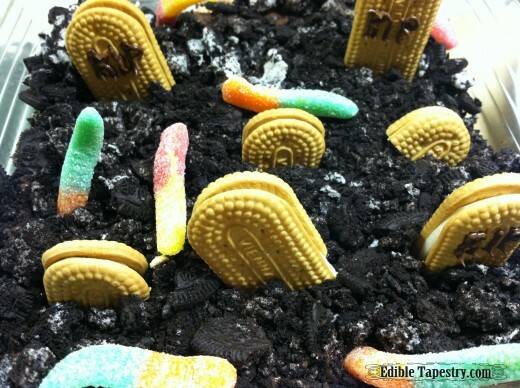 Of course we made one of those silly “graveyard cakes” with chocolate pudding, Oreo dirt, Vienna Finger headstones (with Nutella lettering), and gummy worms. What’s a Halloween party without it? Update: Check out the 2014 version of Creepfest, Zombiefest, timed with The Walking Dead Season 5 premiere and a recipe for Chocolate Mint Zombie Cookies here.